Reinhart & Rogoff respond unpersuasively to their critics. 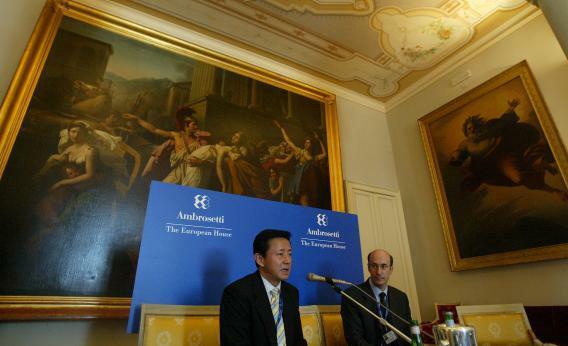 Fan Gang, left, and Kenneth Rogoff speak during the Ambrosetti economic and financial workshop at Villa D’este Hotel at Lake Como in 2005 in Cenobbio, Italy. Controversial economists Carmen Reinhart and Kenneth Rogoff have a response to their critics in today’s New York Times that ought to persuade nobody. The crucial move in this op-ed, as in other defenses of their “Growth in a Time of Debt” piece, is to obscure what it was that was allegedly interesting and allegedly important about the paper. The question, recall, was about the relationship between indebtedness (measured as the ratio of debt to GDP) and economic growth (measured as a change in GDP). The raw fact that there’s a statistical correlation between debt:GDP being high and GDP growth being low is trivial and offers no policy guidance. Countries with a high ratio of sheep to people generally have low populations, but that doesn’t mean that killing sheep leads to population growth. Right? What was interesting about their paper was the apparent finding that a “tipping point” exists at the 90 percent ratio after which growth slows. That was (allegedly) important because it’s different from the existence of a mere statistical correlation and seems to suggest that there’s something out there—what I’ve been calling macroeconomic dark matter—that causes indebted countries to grow slowly even in the absence of high interest rates. It’s this tipping point theory that’s been debunked, and nothing in their response restores it. But of course their is no quantitative proof. In a sense there never was, but the University of Massachusetts counter-paper helped expose how little quantitative proof was there. Now under attack Reinhart & Rogoff are retreating to much softer, much milder, much more defensible claims. And good for them. But that shows how much credit their critics deserve.